There are few general principles of good lending which every banker follows when appraising an advance proposal. 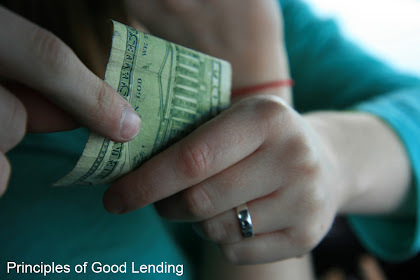 These general principles of good lending are explained in this article. "Safety first" is the most important principle of good lending. When a banker lends, he must feel certain that the advance is safe; that is, the money will definitely come back. If, for example, the borrower invests the money in an unproductive or speculative venture, or if the borrower himself is dishonest, the advance would be in jeopardy. Similarly, if the borrower suffers losses in his business due to his incompetence, the recovery of the money may become difficult. The banker ensures that the money advanced by him goes to the right type of borrower and is utilized in such a way that it will not only be safe at the time of lending but will remain so throughout, and after serving a useful purpose in the trade or industry where it is employed, is repaid with interest. It is not enough that the money will come back; it is also necessary that it must come back on demand or in accordance with agreed terms of repayment. The borrower must be in a position to repay within a reasonable time after a demand for repayment is made. This can be possible only if the money is employed by the borrower for short-term requirements and not locked up in acquiring fixed assets, or in schemes which take a long time to pay their way. The source of repayment must also be definite. The reason why bankers attach as much importance to 'liquidity' as to safety' of their funds, is that a bulk of their deposits is repayable on demand or at short notice. If the banker lends a large portion of his funds to borrowers from whom repayment would be coming in but slowly, the ability of the banker to meet the demands made on him would be seriously affected in spite of the safety of the advances. For example, an advance of Rs.50 lakhs (approx. $111,354.60 USD) on the security of a legal mortgage of a bungalow of the market value of Rs. 100 lakhs (approx. $222,716.82 USD), will be very safe. If, however, the recovery of the mortgage money has to be made through a court process, it may take a few years to do so. The loan is safe but not liquid. The purpose should be productive so that the money not only remain safe but also provides a definite source of repayment. The purpose should also be short termed so that it ensures liquidity. Banks discourage advances for hoarding stocks or for speculative activities. There are obvious risks involved therein apart from the anti-social nature of such transactions. The banker must closely scrutinize the purpose for which the money is required, and ensure, as far as he can, that the money borrowed for a particular purpose is applied by the borrower accordingly. Purpose has assumed a special significance in the present day concept of banking. Equally important is the principle of 'profitability' in bank advance like other commercial institutions, banks must make profits. Firstly, they have to pay interest on the deposits received by them. They have to incur expenses on establishment, rent, stationery, etc. They have to make provision for depreciation of their fixed assets and also for any possible bad or doubtful debts. After meeting all these items of expenditure which enter the running cost of banks, a reasonable profit must be made; otherwise, it will not be possible to carry anything to the reserve or pay dividend to the shareholders. It is after considering all these factors that a bank decides upon its lending rate. It is sometimes possible that a particular transaction may not appear profitable in itself, but there may be some ancillary business available, such as deposits from the borrower's other concerns or his foreign exchange business, which may be highly remunerative. In this way, the transaction may on the whole be profitable for the bank. It should, however, be noted that lending rates are affected by the Bank Rate, inter-bank competition and the Federal / Central Bank's directives (e.g Directives of Reserve Bank of India, RBI), if any. The rates may also differ depending on the borrower's credit, nature of security, mode of charge, and form and type of advance, whether it is a cash credit, loan preshipment finance or a consumer loan, etc. It has been the practice of banks not to lend as far as possible except against security. Security is considered as an insurance or a cushion to fall back upon in case of an emergency. The banker carefully scrutinizes all the different aspects of an advance before granting it. At the same time, he provides for an unexpected change in circumstances which may affect the safety and liquidity of the advance. It is only to provide against such contingencies that he takes security so that he may realize it and reimburse himself if the well-calculated and almost certain source of repayment unexpectedly fails. It is incorrect to consider an advance proposal from the point of view of security alone. An advance is granted by a good banker on its own merits, that is to say with due regard to its safety, likely purpose etc., and after looking into the character, capacity and capital of the borrower and not only because the security is good. Apart from the fact that taking of security reserves as a safety valve for an unexpected emergency it also renders very difficult, if not impossible, for the borrower to raise a secured advance from another source against the very security. Another important principle of good lending is the diversification of advances. An element of risk is always present in every advance, however secure it might appear to be. In fact, the entire banking business is one of taking calculated risks and a successful hanker is an expert in assessing such risks. He is keen on spreading the risks involved in lending, over a large number of borrowers, over a large number of industries and areas, and over different types of securities. For example, if he has advanced too large a proportion of his funds against only one type of security, he will run a big risk if that class of security steeply depreciates. If the bank has numerous branches spread over the country, it gets a wide assortment of securities against the advances. Slump does not normally affect all industries and business centres simultaneously. 7. National Interest, Suitability, etc. Even when an advance satisfies all the aforesaid principles, it may still not be suitable. The advance may run counter to national interest. The Federal / Central Bank (e.g Reserve Bank of India, RBI) may have issued a directive prohibiting banks to allow the particular type of advance. The law and order situation at the place where the borrower carries on his business may not be satisfactory. There may be other reasons of a like nature for which it may not be suitable for the bank to grant the advance. In the changing concept of banking, factors such as purpose of the advance, viability of the proposal and national interest are assuming a greater importance than security, especially in advances to agriculture, small industries, small borrowers, and export-oriented industries. L.C. Mather describes an ideal advance as "one which is granted to a reliable customer for an approved purpose in which the customer has adequate experience, safe in the knowledge that the money will be used to advantage and repayment will be made within a reasonable period from trading receipts or known maturities due on or about given dates."